Weight: 0.51 ct; size: 6.07 | 4.07 | 2.80 mm; shape: oval; colour: medium dark green; strong; clarity: translucent; cut: fair; treatment: none. 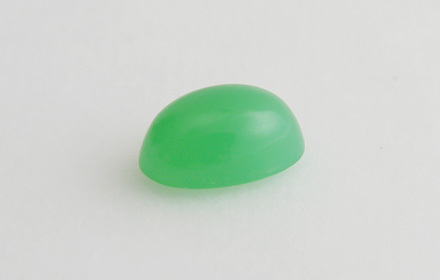 Clean specimen; cabochon style cut. Source: David Weinberg, Multicolour Gems Ltd.